On paper, Mark Dowds is every inch the Silicon Valley success story, but getting to where he is today makes for a humbling read. Mark, co-founder and chief strategy officer of Trov Inc, one of the world's fastest growing Insurtech companies, and co-founder of tech hub, Ormeau Baths, is a philanthropist at heart. His success, it would seem, is a by-product of his "roundabout" desire to help others realise their own dreams. A former theology and divinity student at Queen's University, Belfast, Mark's initial calling was as a missionary, he says. It was a vocation that was inspired by his father, a very successful, but altruistic, businessman, who operated a host of enterprises in Belfast, including a pet store, aquarium, animal feed distribution centre and a manufacturing plant. "My parents were very generous, not just to me, but everyone around them. My dad was very active in the community and gave most of his money away," says Mark, who grew up in Ballygowan. He went to school at Royal Belfast Academical Institution. "I left and went straight to business, not university initially. I went to work with my dad and in 1992, I decided to leave, but my path wasn't initially to go into tech. I went to Queen's to become a missionary. I had made some money from the family business and didn't want to do that anymore. I had a desire to serve others, so instead I became a youth worker, working at the Christian Fellowship Church until 1998 and I absolutely loved it," he says. Mark married his wife, Claire, in 1997 and after a trip to a youth workers' convention in Vancouver, she told him she wanted to make a permanent move to Canada. "We went there and I set up a centre to help young people develop their career paths," he adds. "One of the things I recognised was that young people didn't really know what to do with their lives, so I inadvertently established Canada's first business accelerator with my partner, Ian Lovette. Basically, people came to us for advice and to work on their ideas, most of which were technology related. I learned as I went along," he says. Mark may have acquired a lot of his tech skills 'on the job', but he always had an interest in IT, describing it as a hobby. His business triumphs today are the combination of his hobby and "taking the entrepreneurial life learned from my dad and applying it to business" he says. Trov, which Mark jokes takes up 110% of his time, is the world's first on-demand insurance platform enabling customers to insure as and when needed. Mark says: "There are no lock-ins, no annual policies, you pay for whatever you use, so when you get into a car, the insurance turns on when you're moving." It's a unique service that has yet to spawn any competitors and it has a presence all over the world, but it's not Mark's first business victory. He has been involved in several successful start-ups, including Band of Coders, ServiceCloud and CreationStep. In addition, he ran one of Canada's most successful incubators in Toronto for several years, helping to lay the foundations for the now-booming Toronto tech scene. Also an early stage investor, Mark has invested in companies such as Uber and Twilio. It was the move to Silicon Valley with his family that allowed him to create and realise the concept behind Trov with friend, Scott Walchek, also co-founder of the business. He stayed there until January 2015, when Mark, his wife and two children, son Shaughan, now 18, and daughter, Eirann (16), travelled back to NI to look after both grandfathers who had been diagnosed with dementia. It was a selfless move for the family, but one which was a no-brainer for Mark. "My wife's parents were ill, her dad has dementia, and I discovered my dad had dementia around the same time. Both our parents were very good to us and we wanted to make sure that they were looked after," he says. The move didn't strike a chord instantly with his children, he admits, but annual trips to Canada, where they work at summer camps, has softened the blow. Mark's daughter studies at Bloomfield College and "is a wonderful singer, but she doesn't take that after me", while his son is head boy at Strangford College, where he studies ancient history and philosophy. "My son took to the move like a duck to water and settled well. He plans to go to the University of Toronto, I think he affiliates himself with Canada, but for my daughter, the move was tougher. She misses a lot of her friends and pines for California, but she has settled well. Both work the summer in Canada at sports resorts, where they learn leadership skills and get paid," Mark says. 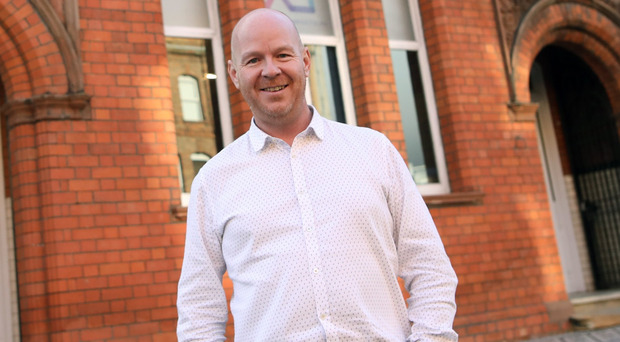 Not one to rest on his laurels, Mark, while still running Trov and travelling the world from a Belfast base, wanted to give back to Northern Ireland and so Ormeau Baths was founded - a co-working space and tech community dubbed "an entrepreneurial campus". Just last week, it opened a new wing, covering 9,000 sq ft, which hosts gaming development and also plays home to Pixel Mill, part of NI Screen. "When I came home, I recognised that it was a very different place. When I left, you wouldn't have heard of people starting tech businesses, but when I returned home, thanks to organisations like Catalyst Inc, Young Enterprise and Invest NI, they have seeded into the community that it is possible to do good things and become a global corporation operating from NI. Over the last decade, there has been an emergence of new companies that are taking our economy into a new age. "I saw so many of these folk meeting in different places, but what that community lacked was a tech hub in the centre of Belfast, which is why a few of us got together to invest into setting up the Ormeau Baths. "It was created for the benefit of the community and it's not something we want to cost us money for years and years, but equally, we haven't established it for our own personal wealth." Mark works alongside other leaders in business to ensure the funding of the centre. Among those peers are Kaninos' Tom Gray and late comedian Frank Carson's son, Tony. Mark defines Ormeau Baths as his "passion project". And it's not the only philanthropic role he plays in NI. He is also chairman for two other programmes here; TechstartNI, an early stage venture capital company and another set-up, Generation Innovation, that "reinvents work experience" . It's a hefty workload for a man who divides his time between Singapore, Shanghai, Tokyo and California - and that's just this week's itinerary. Mark also has to find time for his hobbies, which are endurance mountain biking and running. He's been known to have bikes delivered to hotels around the world to ensure he gets his fitness fix and he's also known to have completed 24-hour endurance races, as well has having crossed the finish line of 14 ultra marathons in one year alone. "I'm very energetic and disciplined," he says when asked how he manages such a jam-packed schedule. "I'm very organised and very calm and this enables me to do things locally and work full-time. I do travel most weeks, but I make sure to take a period of a month or six weeks not to travel, so I can have a reset on all the disciplines and check in on my friends, so they know who I am. "I've a big passion and love for Belfast and it's exciting to be home and know that I can contribute and do something and no matter how much I travel, I make the most of it."